MDC-T president Mr Morgan Tsvangirai embarrassed his deputy Ms Thokozani Khupe by lifting the suspension she imposed on the party’s Matabeleland South chairperson, Mr Solani Moyo, whom she accused of threatening to assault her. Ms Khupe on Monday suspended Mr Moyo for allegedly charging at her with the intention of assaulting her at a party voter registration outreach programme at Ndolwane, Matabeleland South, on November 25. She charged that Mr Moyo had to be restrained by the party’s national organising secretary Mr Abednico Bhebhe and national chairperson Mr Lovemore Moyo. Ms Khupe was criticised for her actions by party members who accused her of breaching the party’s constitution by unilaterally suspending Mr Moyo. But she said his conduct was tantamount to gross disrespect and undermined her as an elected senior leader. In a letter to Ms Khupe on Thursday, Mr Tsvangirai expressed shock that she had gone on to suspend Mr Moyo before he could respond to her request to suspend him. Mr Tsvangirai intimated that Ms Khupe could have breached the party constitution by suspending Mr Moyo in a case where she is a complainant, adding that he was also in possession of a letter from the Matabeleland South chairperson regarding her conduct on the day. 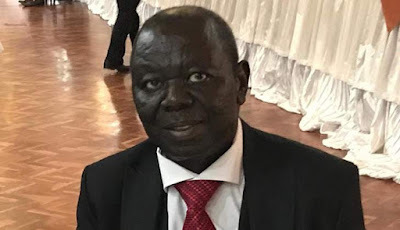 “I am disturbed that before I even considered your request and the issues surrounding the same, you have gone ahead to suspend the party’s chairperson in a matter in which you are a complainant and gone public on the same,” wrote Mr Tsvangirai to Ms Khupe. Mr Tsvangirai said he was referring the case to the party’s arbiter general to make a determination and advise him on the way forward, while Mr Moyo carried on with his duties as provincial party chairperson. Mr Moyo this week dismissed his suspension as a joke, arguing that Ms Khupe had no powers to suspend him. He denied being violent towards Ms Khupe, but accused her of holding a meeting in his province without his knowledge. Mr Moyo said he differed with Ms Khupe’s message against the formation of a coalition of opposition parties to challenge the ruling Zanu-PF in the 2018 elections.